Decorate yourself for St David’s Day! It is a well known fact that the irish celebrate St patrick day and this is a celebration that has been embraced by most Americans. But did you know that there are three other celebrations? The English celebrate St George’s Day, The Scottish, St Andrews day. Today is St Davids day and is celebrated by the Welsh. Children will wear traditional welsh costumes to school and it is common to wear a daffodil pinned to your lapel. 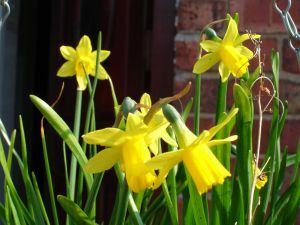 The daffodil is the national flower of Wales. Design yourself with the color of spring!